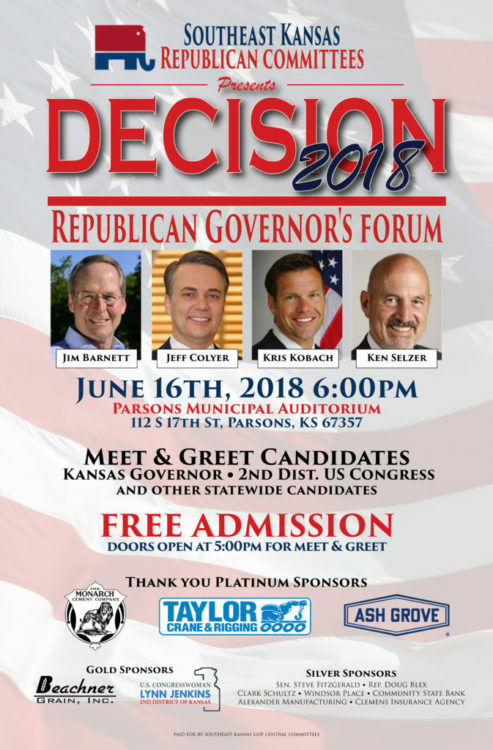 Several Southeast Kansas (SEK) Counties have been working together to organize and host a Republican Governor’s Forum. The intent of the Forum is to educate voters and promote the SEK region. Four Republican county chairs, Don Alexander of Neosho County, Marsha Wallace of Crawford County, Mike Howerter of Labette County and Virgil Peck of Montgomery County have invested many hours in preparation for what they expect to be a big event for SEK. The event will take place in Parsons, at the Parsons Municipal Auditorium, located at 112 S. 17th – one block west of the main north-south corridor (Hwy 59 or 16th street) in Parsons on the evening of June 16th. The doors will open at 5:00 and the Forum will formally start at 6:00. Virgil Peck, the “unofficial chairman” of the group, said the idea came to him in the middle of the night several months ago. Soon after, he approached the other county chairs about the idea and says, “They all liked the idea and were immediately willing to join together to make it happen”. 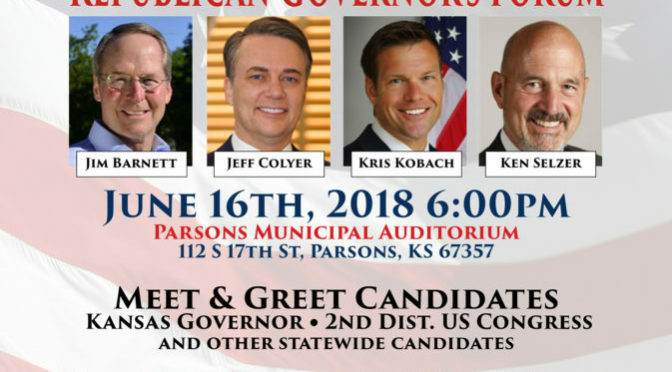 All five leading Republican candidates for Governor have confirmed their attendance and participation. They are Governor Jeff Colyer, Secretary of State Kris Kobach, State Insurance Commissioner Ken Selzer, Dr. Jim Barnett and Patrick Kucera. In addition to the candidates seeking the office of Governor, several Republican candidates running for 2nd District Congress and other statewide offices will be at the event to visit with voters. There will be free literature and yard signs from the many different candidates attending the Forum. It is recommended that attendees arrive early to get the best seats. Additionally, at 5:40 there will be a pre-forum event to introduce and hear from the candidates for Second District Congress.